I started this patchwork cross stitch project way back in 2014, as a way to make use of those scrappy bits of leftover embroidery thread (floss) which aren't quite big enough to be worth keeping and winding back on the bobbin but which still have a few stitches left in them. 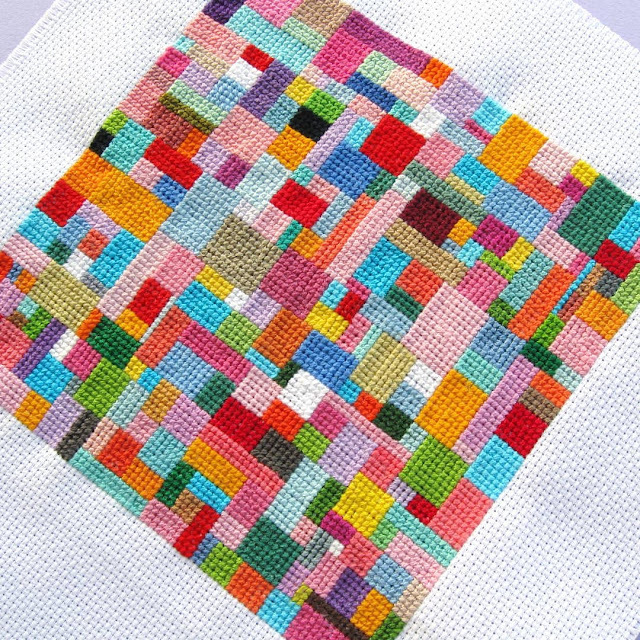 I saved up the threads in a compartment in my embroidery thread storage box, then would sit and do a whole batch of stitching in one evening - slowly building up the patchwork design in blocks of colour. It was a super relaxing process! As I wrote when I blogged about this project last year, "I guess I could add a block at a time, each time I have a piece of leftover thread, but I quite like spending a few relaxing hours working on this from time to time. Plus, adding a bunch of colours at once helps me make the randomness of this project more of a controlled randomness - I can spread out the colours more easily, and get a more pleasing mix of tones and shapes than I think I would end up with if I added a block each time I had a scrap of thread to use up. I like the randomness of this project and how the colour palette (and the speed at which it's growing) is entirely dictated by what other projects I'm working on, and the luck of what size thread scraps I'm left with... but I also want it to be something I love the look of when it's finished!" To read more about how this piece has developed, click here to read all about how the project has progressed over the years and see lots of in-progress photos. I'm really pleased with how the finished piece has turned out - someone pointed out that it looks like a tiny quilt, and it totally does! It's about 6 inches (15 cm) square and absolutely jam-packed with colour. Loads of happy hours of stitching have gone into it, but it also represents even more hours of stitching as, of course, these are all just the leftovers from other projects! 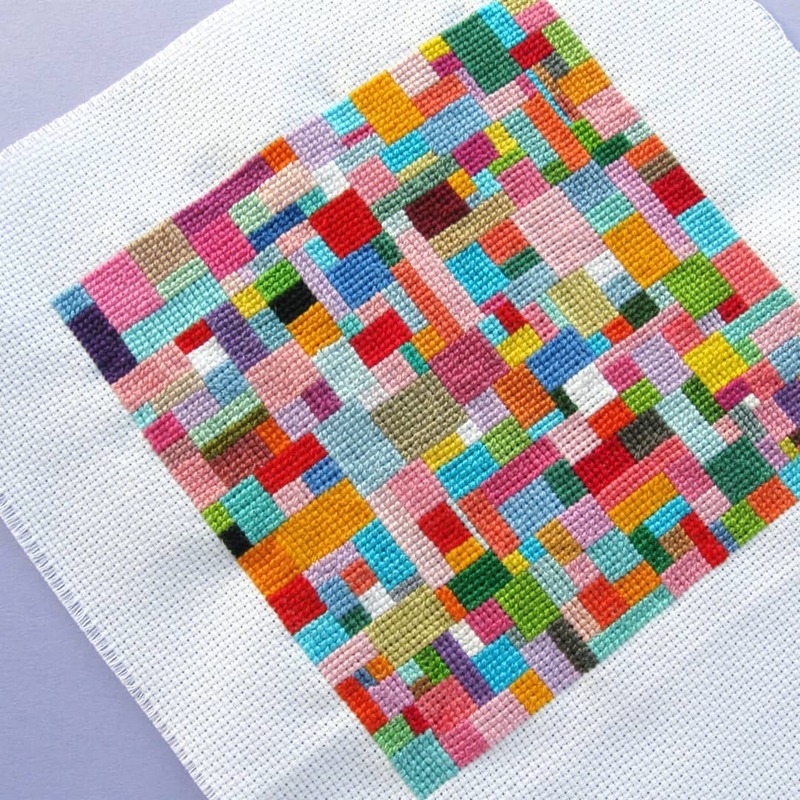 Want to make your own patchwork design from leftover threads? Simple! 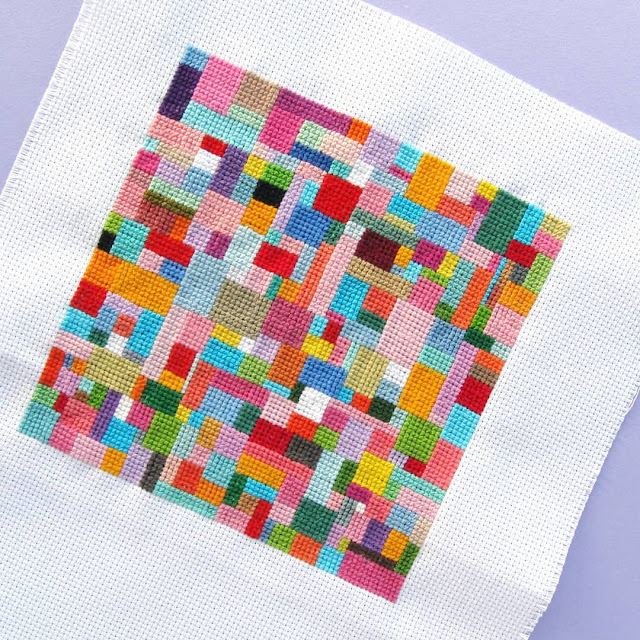 Just start keeping your own leftover threads, stitch them in blocks and just keep on going until you've slooooowly filled up a whole square with colour. A patchwork design like this is also a great way to use up a whole bunch of embroidery threads from your stash, you don't specifically need to be using leftover threads. Just have fun playing around with colour combinations and shapes! Last year several people asked me for the pattern for this design, which isn't really something I can properly share as I've used to many random colours making this piece. 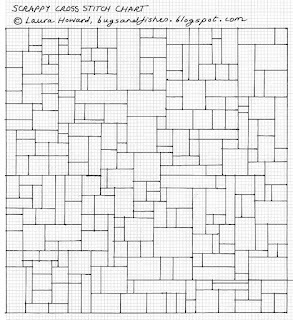 BUT, I have drawn out a chart of how my design ended up, in case you like how the arrangement of blocks look and fancy replicating it. You can use my photos as guide when picking colours and/or use felt tips or coloured pencils to colour in your printed chart to help guide your stitching. Click here to view the chart in a new window or tab, make sure you're viewing it full size then print. P.S. 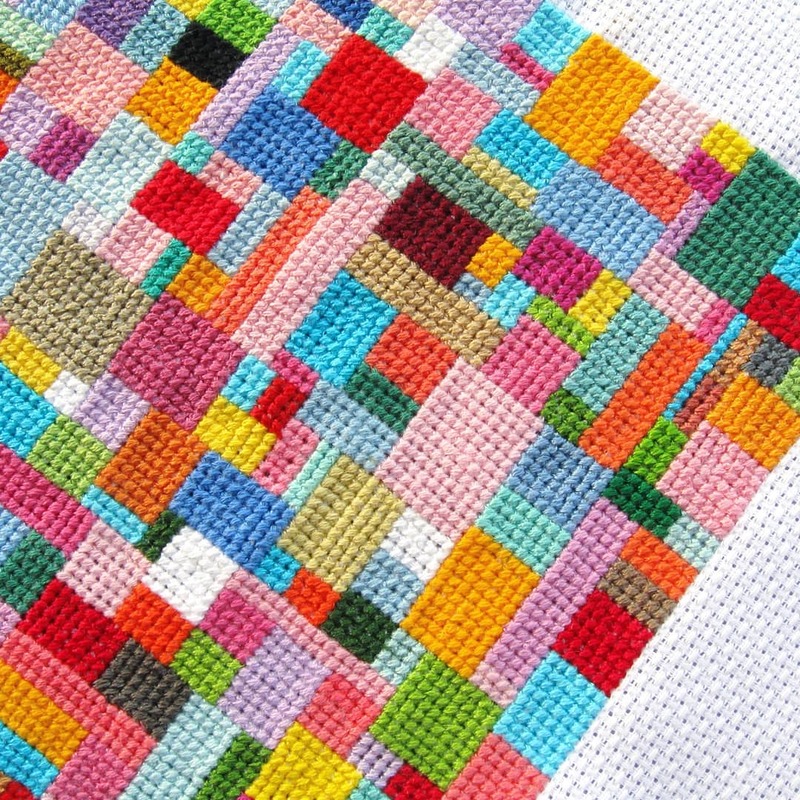 For even more scrappy goodness, check out my Patchwork Mini Squares blanket, knitted from yarn left over from many years worth of knitting projects. What a great idea!!! It looks fantastic too. Thanks for sharing. I also find that if you do an outline I just use pencil like for a leaf or any item heart could be anything that would handle a fill in and then start with the different color threads it came out so sweet did a set for my sofa.So much fun and I like using the left over threads I also picked up some stray bunches of tread fromm the GoodWill store. This is so nice. Something I should start on as I collected a few heaps of odds and ends and use up like 5%of it a year. Vicki - using an outline is such a fun idea! 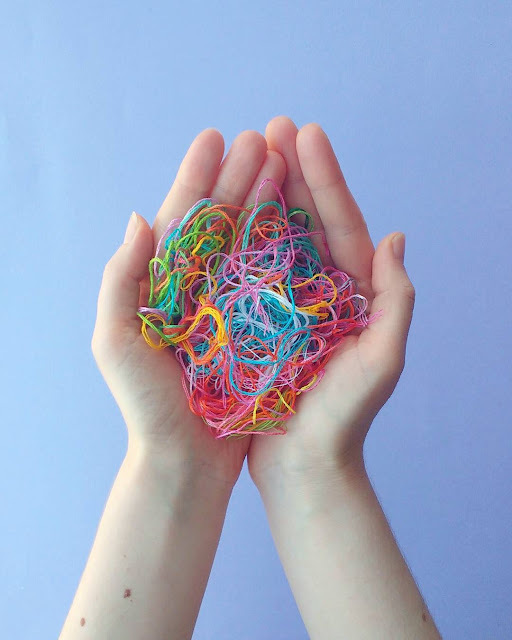 Lily - oh yes there are so many awesome possibilities for using up leftover threads. A pal of mine is stitching a piece from her threads but working row by row, sewing as many x's as she can with the latest colour, then starting on the next. It's really cool! I love this project - so happy to see it finished! It's been so inspiring to watch you make this; I used to only save metallic ends (for a possible Christmas ornament that has yet to happen) but after you started sharing this one, I began saving regular floss too with the hope of stitching something like this :) I've seen a user on Instagram (can't remember who at the moment) who is making a single stitch every day, using each colour she'd stitched with that day, to fashion a sort of memory grid which is an interesting idea too! 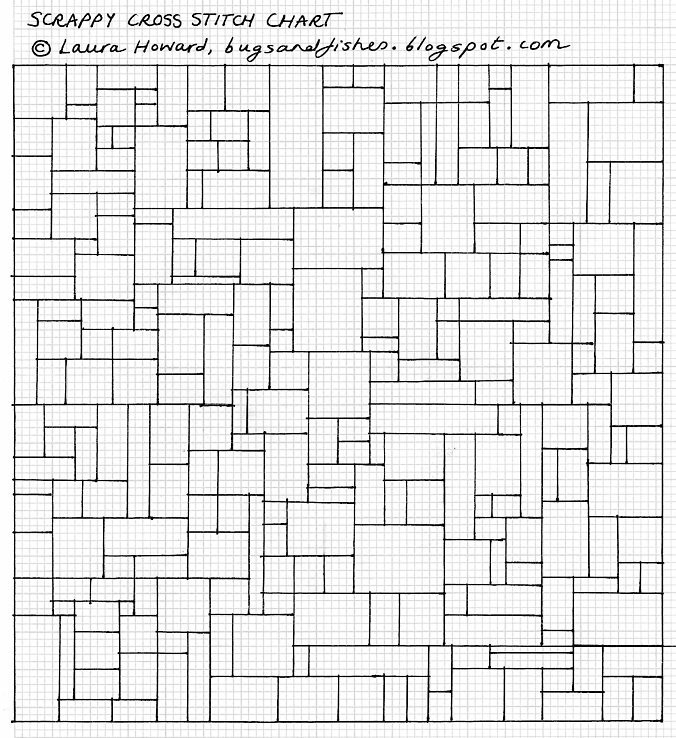 Oh yay, I hope you'll have fun stitching your version :) I love that single stitch project idea, too, how fun.